Ornamental plant nursery Maarten Bloemen V.O.F. was founded on October 1st 1987. After working for ten years with an extensive assortment of plants, including ready-to-deliver products, we switched to acidophilous shrubs. Now we only produce reproductive material such as rooted cuttings and planting material, specializing in a limited assortment. The past years we have been intensively engaged in the production of newly patented varieties. The rooted cuttings are placed only into trays freshly filled by ourselves. Experiments show that this provides us with very good growth results. Nevertheless, we continuously look for new and improved methods, like paper-plugs and preforma-plugs. The majority of cuttings produced are destined for use within our own company, and the rest is available for sale, providing that it is ordered in advance. 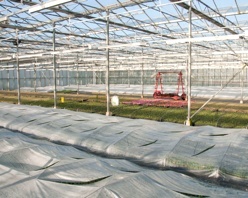 The cuttings for our own use are planted in a round p 9,5 after which they are placed in mara-trays for further growth. The company consists of 2.000 m² of container fields and 10.000 m² of greenhouses. 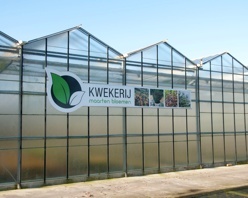 The greenhouses are divided into 3.000 m² for cuttings and 7.000 m² for cultivation, of which 2.200 m² is covered by a cabriolet greenhouse. The climate in the greenhouses and the irrigation system (which is utilized with or without nutrients) are optimized via a computer-controlled system. For five years our reproduction has taken place under LED-light for increased environmental control. The company has eight employees in service. Together with these employees we try every season to produce plants of the highest quality. Miss-Cherry was discovered in our own nursery: Nursery Maarten Bloemen. The plant is named after the children of Maarten and Jacqueline Bloemen: MErijn, LIndy and ROsanne. Miss Cherry has many, many full bunches of red berries. Miss Cherry grows bushy and compact. The leaves of Miss Cherry are deep strong green. A big advantage is the resistance against several diseases. Miss Cherry is very floriferous between May and July en therefore bears many berries from July until February. The berries can be used for the preparation of jam, compote or juice. Plant Miss Cherry in a sunny or semi shadow place for maximum pleasure. Vaccinium vitis idaea Miss Cherry ('Meliro' PBR) has been discovered by Maarten Bloemen and is protected by European Plant Breeders' Rights under no. EU 20101540. We do not sell privately.